With pleasure we introduce The Next Ad to you! Learn more about this interesting company. Hans Disch of 24i illustrates his view on adopting the changing TV paradigm. 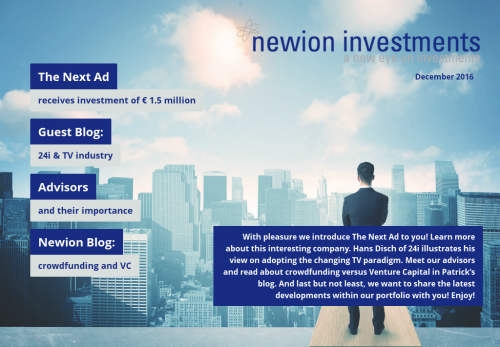 Meet our advisors and read about crowdfunding versus Venture Capital in Patrick’s blog. And last but not least, we want to share the latest developments within our portfolio with you! Enjoy!